My mother caught this moment with her phone yesterday and it has stirred tremendous emotion within me from the moment I first laid eyes on the photo. The man’s face in the photo is my father. When he died in March the funeral director took a great photo my mom had of my father and she and had it made into a tapestry. My mom has the tapestry placed on the back of her couch in the center of her home with dad’s face exposed very prominently. The photo of my father was a priceless photo that caught the true essence of the person he was on this earth. It captures the Christ-like love and joy that poured from his eyes and his life. It captures the expression he would have had if he were actually there holding his precious little grand daughter. That day my sweet four year old niece was not feeling well. My mom cared for her while my sister and brother-in-law were at work. First they were at my sister’s home and decided to watch the video of pictures of my father from his funeral. One of my mother’s greatest concerns has been that her grandkids have not had the opportunity to express their grief as his death was such a surprise. At the time we were all focused on our own personal loss of him. Grief is different for us all, but we all feel the loss no matter our age or the amount of years spent with the one we love. Evelyn only had four short years and it is important to us all that she and all the grandkids get to know what an amazing Godly man their Papa was. Shoot I had 41 years and I still feel like the time was cut way too short. My mother had 44 1/2 years of marriage to him and longs to have had more time. Mom and sweet Evelyn then went to my mother’s house for some lunch and to watch a movie. Evelyn had spent a lot of time there with Papa watching movies and eating popcorn. It was after the movie my mom caught this moment. She said Evelyn was hugging and had been actually rubbing her hand along my father’s face. Torn, she decided to go ahead and take a picture of the moment. The longing in Evelyn’s eyes is priceless. It makes my heart hurt all over again for our loss. This picture of Evelyn reflects what is happening with this little girl that is still inside of my 41 year old body. There are days that I still want to hug my daddy’s face. There are moments that I want his advice or to just take a long walk looking at God’s creation with him. Evelyn’s expression doesn’t just capture the emotion of our family, but of all people hurting and missing a loved one. 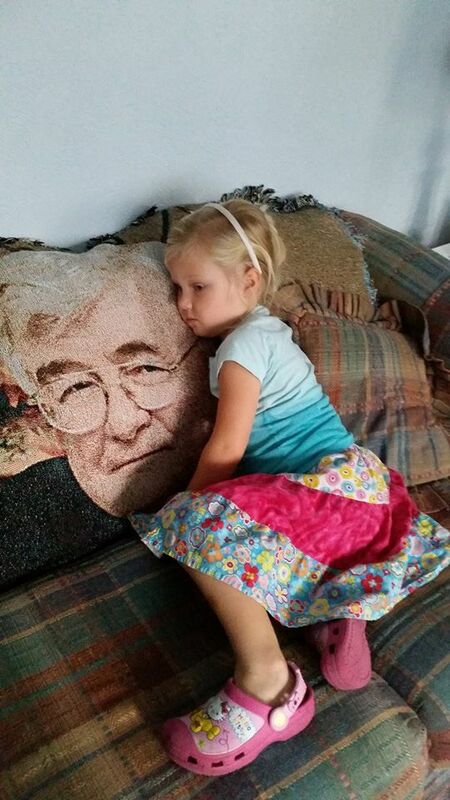 No matter who we are there is still a sweet little 4 year old within us all that longs for that fatherly love. Many of us may never get to know the love of a earthly father like I was so blessed with. This is not a bragging statement, but an acknowledgment of the fact that having a loving father is truly a gift. More and more are without father’s on this earth. Ever wonder why the earth is growing more and more evil? There is a tremendous shortage of loving daddies out there. This picture brings out the emotion of gratitude within me as well as my grief. Gratitude for an amazing father and for the time I did have with him on earth. Also a deeper gratitude for what God did for us by sending Jesus to die on the cross so that we have the opportunity to no longer be separated from our loving Heavenly Father, God, by our sins. You see no matter what we are dealt in this life, an absentee dad, an abusive dad, or a good dad we all actually have a loving Father. God longs for our love and He is always waiting with open arms. He gave us freewill because He wants us to long for Him as well. To have a relationship means both parties desire to have that closeness and love. God sent Jesus to bridge the gap that our sin causes so that we can curl up into the loving arms of our Heavenly Father, God. It is moments of pain like missing my earthly father so much that I feel the presence of God so deeply. He gives me eternal perspective and fills my heart with such joy, peace, love, and compassion for this world I live in. All attributes that don’t flow from me they are only attributes that come from a perfect, Holy, almighty, all-powerful, creator, God. I am also reminded that for the follower of Jesus death is not the end. It is the beginning of true life. I can say with BOLD confidence that I know for sure my father is in heaven. I can say with BOLD confidence that I know I will one day be there too and see my dad again. Oh how amazing that day will be to get to thank Jesus face to face for giving LIFE!!!! Awwww, what a sweet photo. Thank you. I have been weepy from the time I saw the photo yesterday. So much emotion that demanded expression through words. I love your desire to paint word pictures too!! 🙂 Have a great day!!! That makes me want to cry, that is so sweet.